Colombia has a hard time shedding its bad boy image, which is understandable, as it has been in conflict with guerrillas for years. However, with the signing of a deal with FARC (The Revolutionary Armed Forces of Colombia) this past September, peace has never been so close. For this achievement, President Juan Manuel Santos was awarded the Nobel Peace Prize for 2016. Meanwhile Colombia’s tourism has been on the rise for quite some years, making it an attractive country for travelers: there is enough infrastructure and (tourist) information to make it easy to move around while the country is still abound with off-the-beaten path destinations and activities. In Colombia, you will not simply savor a cup of coffee, but see where it’s made. You can learn to dance salsa in Cali or admire graffiti artists in Bogotá. And art buffs, don’t forget to check out Botero’s sculptures in Medellin. When in need of some quietude, you can linger in one of the many idyllic Andean pueblitos such as Villa de Leyva, Jardín or Jericó. Be open to local people and you will be amazed by the Colombians’ hospitality. A note of caution: This doesn’t mean you should travel just anywhere outside the well-known tourist areas such as Bogotá, Cartagena, Medellin and Salento. Check with local authorities whenever you want to travel off-the-beaten path. Bogotá offers a wide array of restaurants, cafes and museums (don’t miss the Gold Museum—El Museo del Oro—on Parque Santander). But the city stands out for one particular sight: its graffiti scene. Contrary to pretty much any other country in the world, here this form of art has been legalized. Instead of creating quick, crude and rushed drawings painted in the darkest hours of the night, in Bogotá graffiti artists can leisurely work during the day—the police will come and admire the scene instead of sending them away. Many of the graffiti projects are paid for by the government or are commissioned by the owners of the buildings. A free two-hour tour leads you along dozens of artworks in El Parque de Los Periodistas. The guide gives you insight into this culture, explaining the differences in graffiti styles, the materials artists work with and how to recognize the signatures of renowned graffiti artists. 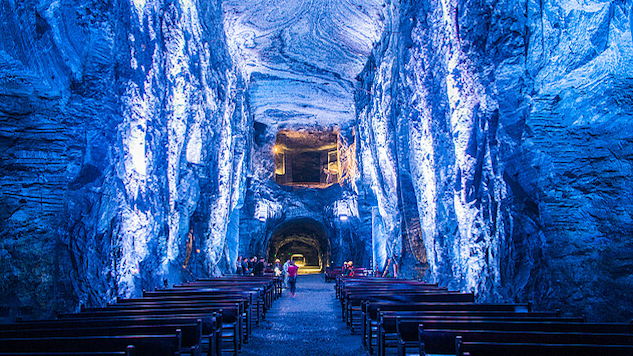 What started in the 1930s as an underground chapel and altar for the salt miners to pray and honor their Virgin has grown into a humungous cathedral situated 656 feet underground. In pre-Colombian days, the indigenous people mined salt in the area, but colonization brought commercialization and in the 1800s the mines were turned into a system of tunnels to optimize the profits. Today you can tour part of the tunnels that are no longer mined, and the cathedral (pictured at top). You don’t need a guide, but avoid Sundays, as they are exceptionally busy. If you are interested in the salt-mining process, visit the nearby Nemocon salt mine. Tours are mandatory and provide insight into the salt mining history and process. Both mines can be visited on a day trip from Bogotá. Inspired by the slow food movement, Cittaslow is an Italian organization that aspires to increase the quality of life in towns around the world. The town of Pijao is Latin America’s first Cittaslow, and on arrival it is easy to see why. The colorful, small town centers around a laid-back plaza that is surrounded by coffee bars and traditional houses built with barreque (bamboo cut lengthwise and filled with adobe). Pijao invites you to stay, meander its streets, play chess at its outdoor cafe on the plaza and share a cup of coffee with the locals. One of the key elements to Pijao’s Cittaslow status is to encourage sustainable tourism. Check out new local initiatives such as mountain biking and bird watching or plan your visit in September, when Pijao will host Colombia’s second Festival de Sabores, Sonidos y Saberes (“Flavors, Sounds and Knowledge”). You are bound to visit at least one coffee plantation in El Efe Cafetero (Colombia’s coffee region), and Salento is Colombia’s most famous and touristy coffee town. For those who like some privacy with their coffee, check out the pleasant colonial towns of Jardín and Cuidad de Bolívar. Sign up for a tour of a coffee plantation or sit down in the town’s shady plaza and savor a cup of café (not to be confused with tinto, which is a weak, cheap coffee generally bought from vendors on the street). Colombia’s coffee region is on UNESCO’s World Heritage List. Speaking of World Heritage Sites, Colombia has a number of them. Among them are historic sites such as San Agustín Archaeological Park (pictured above) and Archeological Park of Tierradentro, which both are well visited. On the other hand, the multiple-day hike to the Lost City (Ciudad Perdida) in north Colombia is still an undiscovered option, something that’s bound to change as numbers of visitors to Colombia increase. So if you like hiking and visiting historic sites in relative solitude, than this is your trek for 2017. Go to the north coast for the beach, visit Tatacoa for a bit of desert, drive through the coffee region to get your share of mountains (and caffeine), and add Mocoa to your list for a pleasant Amazon jungle hike. In the far south of the country and for years off the map due to FARC’s presence, the Mocoa area has opened up and is expected to continue to do so, especially now that a deal has been signed with FARC, paving the way toward peace. This is a place for some serious off-the-beaten-track exploration. Expect lush jungle, waterfalls and cute monkeys like the tamarin. Don’t venture out on your own as some areas are infested with landmines. The recent opening up of the Putumayo region also means easier, and safer, access to the thus-far little-used, by foreigners, border of San Miguel, which takes you right into Ecuador’s Amazon Basin. Another region that’s opening up is Parque Nacional Natural Sierra de La Macarena. Here, between September and November the Caño Cristales river runs in a combination of shades in red, blue, green, yellow and orange. You once had to visit the area with a guide, but you can now travel here independently. Fly in or, for the truly adventurous, overland by motorcycle or car (for the latter: do check with local authorities whether the road via San Vincente del Caguan indeed is safe).